“I am a product of the Midwest. Family circumstances meant that I attended four different grade schools, two high schools and three colleges. Yet despite all this change, or maybe because of it, home life remained structured, disciplined, and grounded in religious dogma. Schedules were rigid. Conformity was encouraged and valued. Exploration or experimentation, shunned and suspect. This ying-yang conflict affects me to this day. I crave change and new experience while at the same time finding myself drawn back to the stability of solid ground – the landscape. Often in my landscape painting, there is tension between the freedom of color and brush stroke against the solidness of the earth; the violence of the sky against a calm earth; or the chaos of earth against the serenity of the heavens. Sometimes I’m accused of painting two different paintings on the same sheet of paper – but in reality, I am painting the truth, the ying-yang that is deRuyter." Minnesota artist Calvin deRuyter was born in a small town in northeast Iowa and spent most of his life in the Midwestern plains. Raised in a Calvinist household, he remembers loving parents who had very defined ideas of right and wrong. There were strict regimens and rules of behavior, and one did not question certain tenets. Life was black and white. Yet the world outside of family and church was full of temptation and the pulls of secular society. A crisis of faith at 18 led deRuyter to reexamine everything he had been taught, and took him in an entirely new direction. deRuyter first became interested in painting in grade school. A 70-year old neighbor regularly invited him in to see the latest progress on her paintings when he delivered a weekly paper. She sparked such an interest in art for deRuyter that he convinced his high school, which had no art program, that they should at least have an art club. 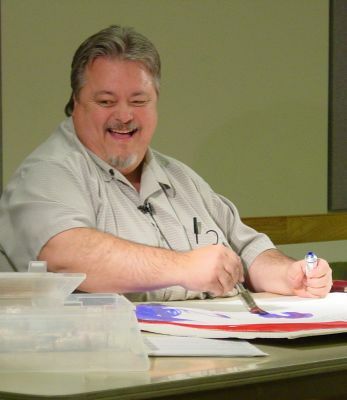 After leaving a pre-seminary program, deRuyter spent a year at a junior college, exploring all aspects of the arts – literature, graphic arts, poetry, music appreciation, and theater. By the end of that year, he decided that fine art, specifically painting, was what he wanted to pursue. He headed off to Hamline University in St. Paul, where he graduated with a fine arts degree in 1975. Although his preferred medium in college was oils, when he re-entered the art scene in the mid-1990s, it was to enroll in a watercolor class. “A good friend kind of dragged me into watercolor, but I really hated it for the first years I worked in it,” deRuyter noted. “I hated all the rules that I thought watercolor demanded.” It was not until a number of years later that someone pointed out that he hated the rules of watercolor, just as he hated the rules of his upbringing, because of the restrictions on thought and expression that he felt in both instances. On the second day of a Skip Lawrence workshop in 2002, Lawrence confronted deRuyter with a simple truth: “You are not having one bit of fun.” deRuyter admitted he really wasn’t enjoying it that much -- that he couldn’t seem to “get it,” didn’t like all the “rules” and “restrictions” that the medium imposed on his creativity, and that he hated what he was producing in his art. That one moment was deRuyter’s artistic turning point. The next morning he started playing with paint the way he paints today…in layers. In watercolor, he works directly from the tube, without a palette, accomplishing all of the mixing of colors directly on the surface he is working on. He can produce a full range of effects in the watercolor medium, from traditional watercolor transparency, all the way to the rich painterly brush strokes you might find in opaque media. "Whereas my landscapes are attempts to embrace and embody the outer world, to be enveloped in the outward spiritual, my abstracts reflect the inner spiritual, where emotions are often shrouded by inhibitions, by lack of understanding or awareness, or by lack of a desire to reveal. Both cases, external and internal, are revelations of my own take on the spiritual."